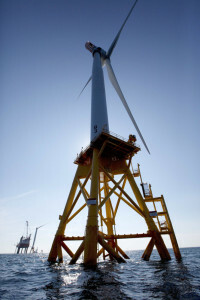 One of Deepwater Wind's turbines is viewed off Block Island, R.I. The nation's first offshore wind farm has opened off the coast of Rhode Island, ushering in a new era for the industry in the United States. One of Deepwater Wind’s turbines is viewed off Block Island, R.I. The nation’s first offshore wind farm has opened off the coast of Rhode Island, ushering in a new era for the industry in the United States.